I recently sent out a plea via Twitter (I’m @Keystone) to find a better way to experience real-life scale buildings. It has long been a frustration of mine (and just about everyone who tries to build rl-scale builds in SL!) that anything built at 1:1 proportions ‘feels’ way too small inside. The most commonly cited reason for this is that people simply customize their avatars too big. Now, this is true to a certain extent, but it isn’t the whole problem. My my av has always been the same height as my real life body, and still has the same problem. 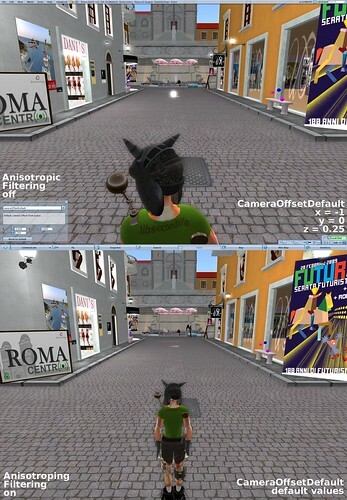 Others blame the FOV settings (you can change these on the fly by playing with cntrl-8, 9 and 0. I’m still unclear about whether or not this distorts the perception of the build, and haven’t had much luck toggling those either. The most commonly offered solution is to build everything 1.5x larger than the real-life dimensions. By doing this, the buildings certainly feel larger, but now door knobs are at the avatar’s neck – and it isn’t to scale with the size of most avatars. I just modified this setting, and it works great! Walking through a build of mine that was replicated at 1.5x the real-life size made the build feel much larger. A dream come true! I’m not sure if you can set these through an account, or if its tied to the viewer installation. For example, if you set up an account in order to give a client a walk-through and set this ahead of time – would it stick if they logged in via a fresh install from their home computer? Another solution came from @steven_nelson who suggested that an attachment could be scripted to set your camera view at a preset location when worn. I think this option might work best – especially if you’re bringing a client in to tour a design concept and don’t want to wade through the Advanced > Debug > CameraOffset settings (unless you can set this up on their account ahead of time as well?). Just give them this attachment and have them wear it. If anyone has the script for such a thing, or the free time to write one, please let me know, and I’ll post it here as a follow-up! Either way, this is a new day for architecture newbs like myself who had no idea such options existed!